If I had a penny for every time my 7-year-old son asked me for a new toy, or suggested I just get some money from the machine at the bank, I’d be rich! I realize he’s just a kid, but it’s important to me that Jack learns the value of working to earn money and saving it (rather than spending every penny). I’ve used these tips to teach Jack about the green stuff—and they worked. Utilize a piggy bank. This is a no-brainer, but popping spare change into your kid’s piggy bank is a great way to explain the idea of saving money for a rainy day. 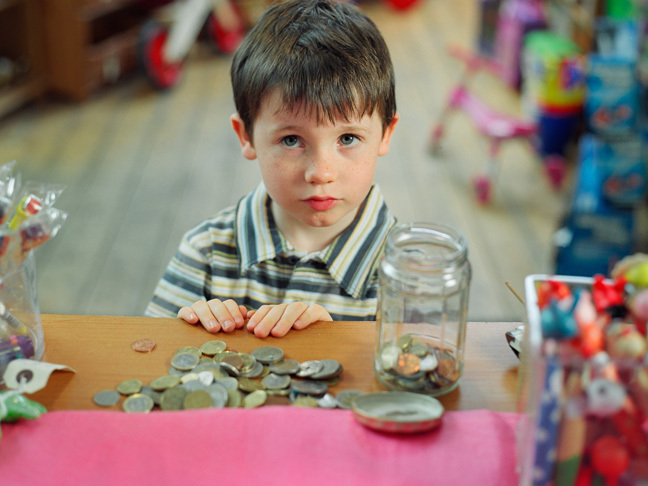 We have a clear piggy bank on our kitchen counter, so my son can see his change accumulating. Now that he’s 7 he can certainly do chores for change, like taking the garbage out, wiping off the table after dinner, and putting his clothes away. When piggy is stuffed we take it to the coin machine at the bank. Jack loves to guess how much money he saved. I let him keep a few bucks for a special treat, but make him march up to the teller and deposit the rest into his account. Don’t be wasteful. Nothing infuriates me more than a half-full juice box or piece of paper with a single scribble of crayon on it. I refuse to throw these items away because in my mind it’s like throwing money away. I make my child refrigerate drinks he doesn’t quite finish and use the front and back of paper when doing artwork. Simple things like this help him understand that everything costs something and we shouldn’t be wasteful. Donate to people in need. When it comes to clothes and toys my son has outgrown, I prefer to donate them to people who really need them. We like to donate to Shelter Our Sisters, an organization that helps women, mothers, and children in need. By piling items into a bag and marching them into the donation center, my child realizes that some people don’t have money for basic needs and that helps him to really appreciate what we do have. Compromise when it comes to spending. I’m all for ice cream out at a special place and who can resist all these trendy self-serve yogurt places that seem to be everywhere? But, at the end of the day, I don’t treat myself to Starbucks every day, so I’m instilling the same idea in my kid. That doesn’t mean I deny my little guy ice cream, it just means I explain it in a black-and-white way. A small cup of vanilla with sprinkles costs like, $2.49, but a big container of ice cream and shaker of sprinkles purchased at the grocery store cost around four bucks total and there’s a lot more than one cup to go around. Remind your child you are lucky. It doesn’t bother me at all when my kid comments that some of his friends have a bigger home than us. As a single parent, I’m happy with our living space and do the best I can. When my son brings up the fact that this kid has a playroom in his house (we don’t) or a TV in his room (um, no! ), I calmly explain to Jack that we have a big TV in the living room we can enjoy together. I never dismiss my son’s statements about xyz or write them off with a cool “So what?” I’ve found it’s better to remind him how lucky we are to have what we do have—because we have enough!